Alright, alright! So to make these chocolate donuts you’re going to need flour, brown sugar, salt, cocoa powder, baking powder, vanilla extract, an egg, butter, and milk. I used whole milk for these donuts, but almond, skim, reduced fat, or soy will all do the job. Not to over mix the batter, especially once the wet and dry ingredients have been combined. Not to over bake the donuts. They only need 9-10 minutes in the oven. They should be fluffy and lightly spring back when gently touched. 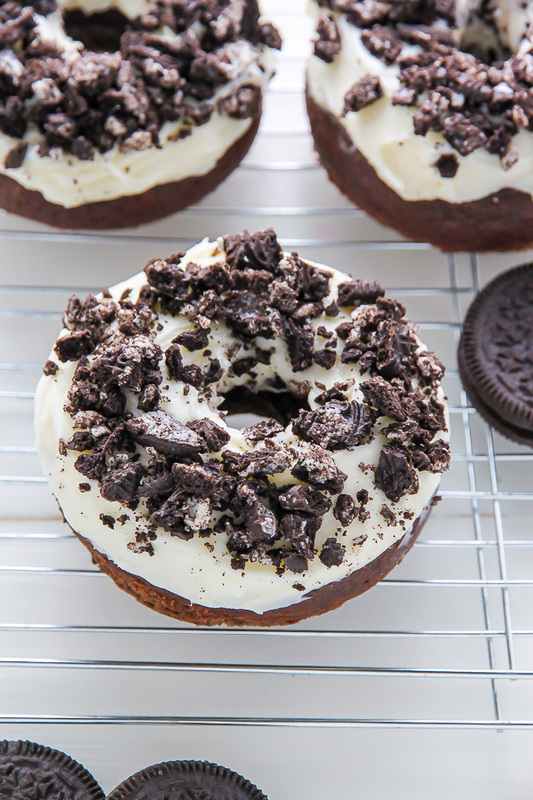 These cookies and cream donuts are so simple to make and are ALWAYS a crowd-pleaser! 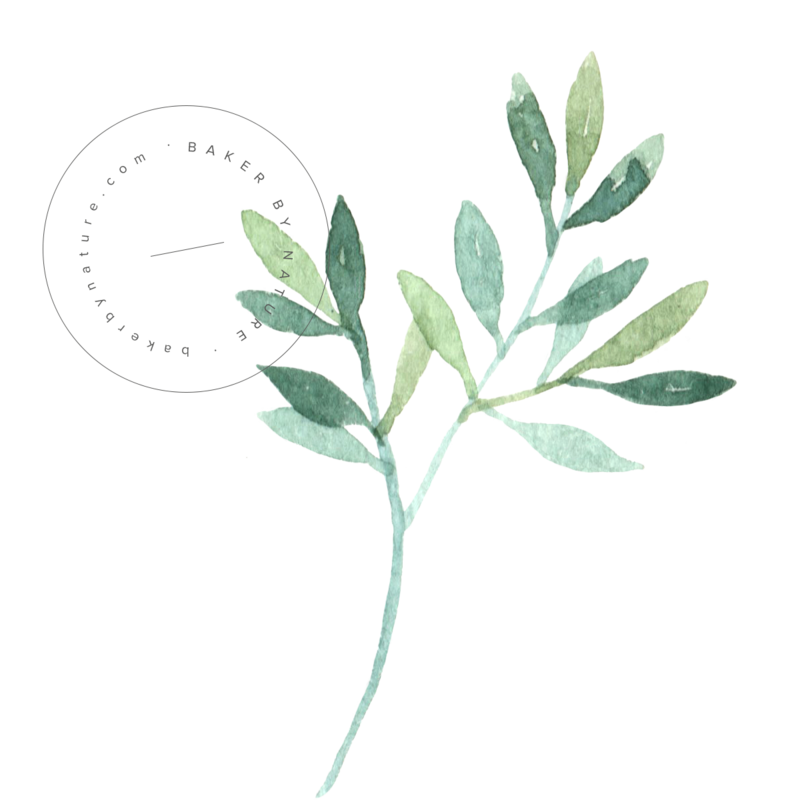 Trust me – if you’re serving a crowd, make multiple batches. I’ve seen friends eat up to three of these donuts in one sitting 😉 Enjoy! 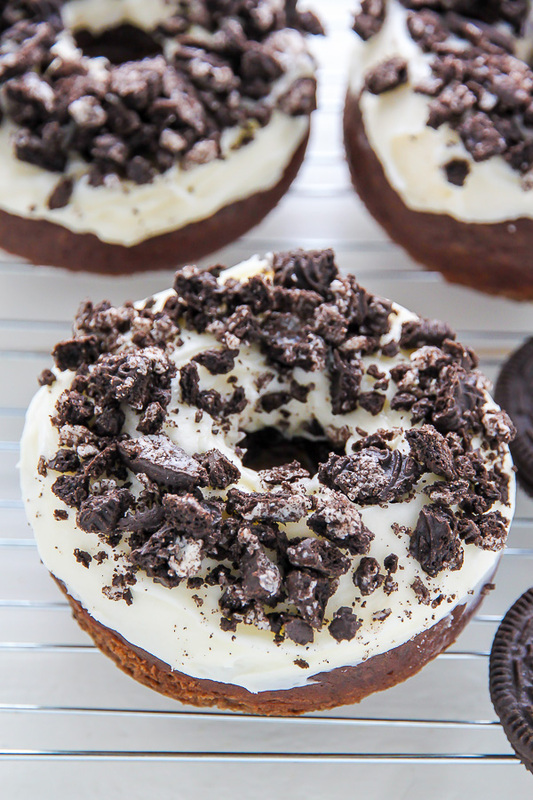 Homemade Oreo Cookies and Cream Donuts are baked, not fried, and ready in just 20 minutes! Preheat oven to 350 degrees (F). Generously grease a donut pan; set aside. In a large bowl whisk together the dry ingredients. In a separate bowl whisk together the wet ingredients, then gently pour them into the dry ones. Fold ingredients together until just combined. Spoon mixture into prepared doughnut pan, and bake for 9-10 minutes, or until the donuts spring back when lightly pressed. Be careful not to over bake here! Allow doughnuts to cool a few minutes in the pan before transferring to a wire rack to cool completely. 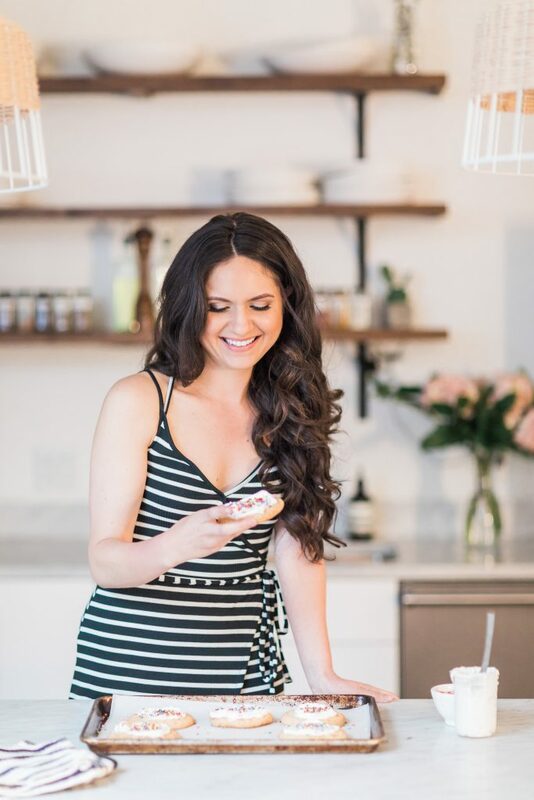 In the bowl of a stand-mixer fitted with the paddle attachment, or in a large bowl using an electric handheld mixer, beat the cream cheese, butter, and vanilla extract on medium-high speed until completely smooth; about 2 minutes. Reduce the speed to low and gradually add the sifted confectioners' sugar. Add in the milk. Once the milk is combined beat frosting on high-speed for 1-2 minutes. 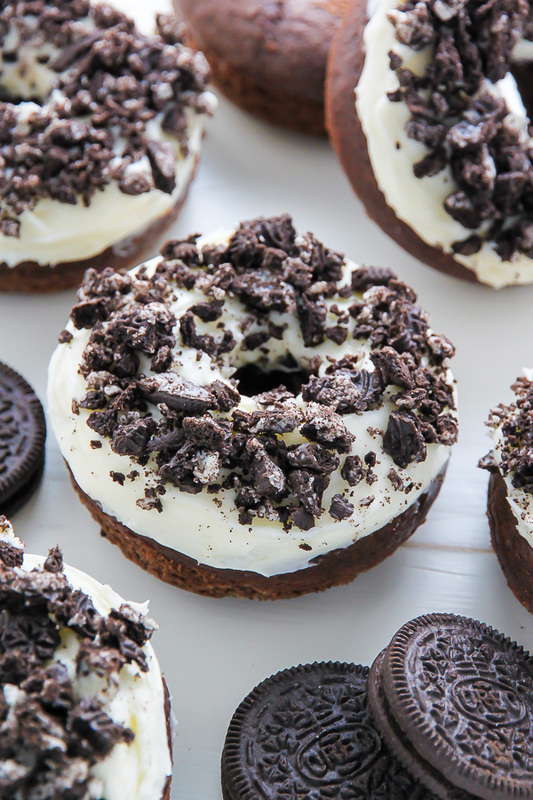 Spread the frosting on top of each cooled donut then sprinkle each with a few teaspoons of chopped Oreo cookies. Serve at once! Donuts are best eaten the day they are made. Everytime you make donuts I think “This is it. Ashley has made the best donut ever.” and then you come out with another recipe that’s even better. YOU ARE A DONUT WIZARD! 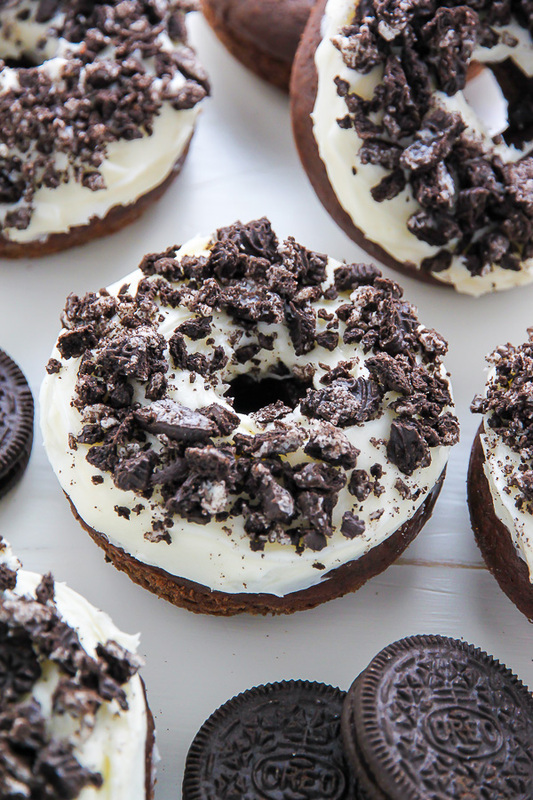 Love everything about these donuts! They look perfect! These look to die for! 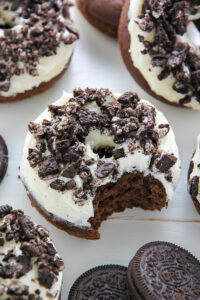 I really need to buy a donut pan so I can make these beauties! 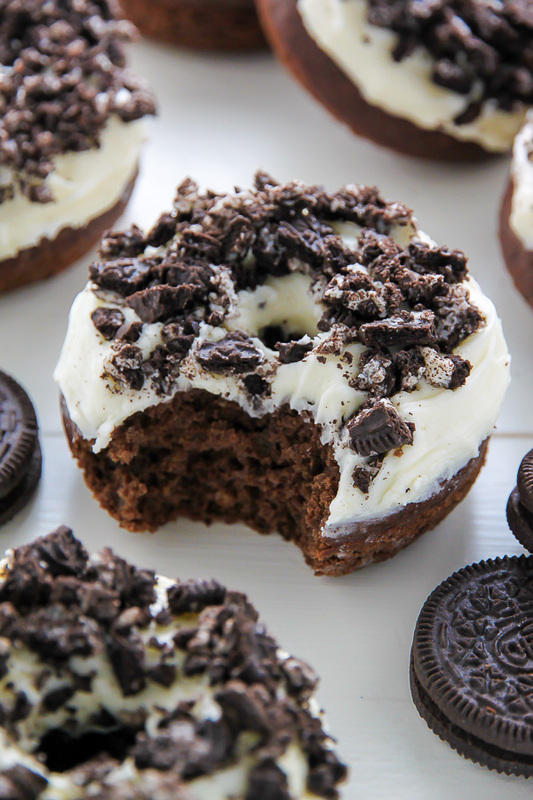 Can i make the same recipe but with mini donut pan?? I tried making them and they came out a little dense is it because I over mixed? Hi Tina. I’ve only made these in a donut pan and cannot think of any alternative ways of making them at this time. Followed this recipe exactly and they came out really dense. Super disappointing. At least the photos look good, that’s really what draws people in anyway. (P.S. 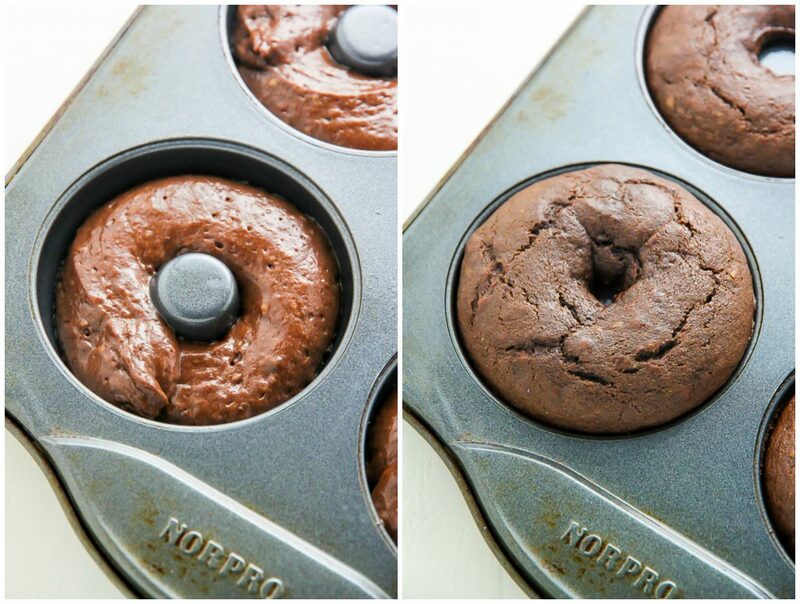 you don’t want to “spoon” donut mixture into a donut pan, that’s just asking for trouble. Fill it into a piping bag and pipe it for better consistency) Even the author of this blog didn’t spoon it, just look at the picture. I just made these with my grandson and they are awesome. So light and airy. I doubled the recipe but not the brown sugar snd they’re a perfect sweetness. I also got 18 doughnuts from the got left recipe. Thomas is going to take them camping to share this weekend. I made these last week and everyone loved them. I’ve made many baked donuts and they typically do not taste like donuts but this recipe was the closest to tasting like a donut so far.